Choral music occupies near-zero space in my diet. Most contemporary choral music does little for me. All too often passable texts are made intolerable, or terrible words become glorified. I will listen to choral music when texts aren’t the point, and when fine performers come together to express themselves vocally. Here are four recentish releases that meet that requirement. No surprise that Aperghis and Nono are here. 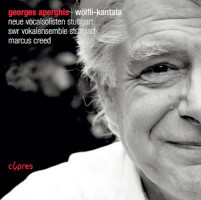 Georges APERGHIS: Wölfli-Kantata (2001-05). Neue Vocalsolisten Stuttgart: Sarah Maria Sun, Susanne Leitz-Lorey, Daniel Gloger, Martin Nagy, Guillermo Anzorena, Andreas Fischer; SWR Vokalensemble Stuttgart, Marcus Creed (cond.). Cypres CYP5625 (1 CD) (http://www.cypres-records.com/). Aperghis treats us to nearly an hour of urgent, exhilarating nonsense. The Swiss artist Adolf Wölfli (1864-1930) spent much of his life in a psychiatric ward where he created intensely colored drawings, sometimes including idiosyncratic music notation. Listeners may strive to find order amongst the finely wrought but fidgety patter. Sometimes recognizable German flitters though (of course, it is possible to hear other things as well). There are five parts: Petrrohl for vocal sextet, Die Stellung der Zahlen for mixed chorus, Vittriool for sextet, Trauer-Marsch for mixed chorus, and Von der Wiege bis zum Graab for soloists and chorus. Petrrohl has already had a life of its own (http://www.lafolia.com/further-aperghis-sightings/). I didn’t catch any Liszt in Von der Wiege bis zum Graab. Wölfli is of course a perfect subject for the theatric and hyperactive Aperghis. The vocalists respond in turn, demonstrating immense flexibility and control as they yelp and sing. These manic burblings sound like little else, except in Trauer-Marsch where repetition and stubborn tonicity suggest Orff. 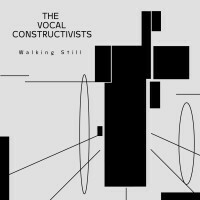 “The Vocal Constructivists – Walking Still.” Mark APPLEBAUM: Medium (2008). Ronald KUIVILA: A City of No Allusions (2012). Pauline OLIVEROS: Sound Patterns (1961). Lauren REDHEAD: concerto (2011). Michael PARSONS: Nevrazumitelny (2013). Cornelius CARDEW: Treatise (1963-67). The Vocal Constructivists, Jane Alden (cond.). Innova 898 (1 CD) (http://www.innova.mu/). Most of these pieces are graphic. Cardew’s Treatise is the granddaddy of them all, inviting and suggestive, yet incomprehensible in how its pages of lines and curves might lead to music. We hear 29 minutes worth, four “movements” (pages 18-45, 111-135, 145-166 and 174-190). Another older “classic” is Oliveros’ phoneme-rich Sound Patterns. At barely four minutes, it was one of the first pieces to pull a chorus together, take away their words and direct them to make noises. Redhead’s concerto uses graphic notation to negotiate performer ownership, alternating ensemble and independent events. Parsons’ Nevrazumitelny may be the most conventional, in that we hear the chorus singing words according to specified (and repeatable) pitches and rhythm. A poem in English by Wendy Mulford whose title means “unreadable” in Russian, the text describes geologic formations and includes the percussive sound of tapping rocks. 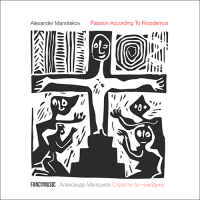 Alexander MANOTSKOV: Passion According to Nicodemus (2012). Cast includes: Ilya Zamchalov, Maria Matveeva, Dmitriy Ivanov, Kirill Manakov. Moscow Contemporary Music Ensemble, Questa Musica Ensemble, Philipp Chizhevskiy (cond.). FancyMusic FANCY022 (1 CD) (http://www.fancymusic.ru/). Here’s an electric performance of an assertive setting for actors, choir and chamber ensemble. Texts are from the apocryphal Gospel of Nicodemus with additional words by the semi-apocryphal Nietzsche. Manotskov’s unified, nearly hour-long procession alludes to other Passions, periods and styles. Luther’s tunes and Bach chorales appear, and the choruses connect with the Russian tradition. There is a jazz treatment of a motive from Messiaen’s Quartet for the End of Time. The instrumental ensemble is small but effective: flute, bass clarinet, trombone, tuba, accordion, percussion, and strings. At one point we hear intentionally amateur violin playing. Most disturbing are the blankets of white noise which intrude and overwhelm, as if we are going deaf or the Passion is receding into the past. 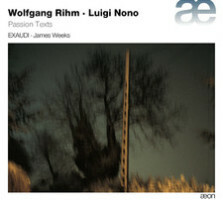 “Passion Texts.” Wolfgang RIHM: Quo me rapis (1990); Sieben Passions-Texte (2001-06); Mit geschlossenem Mund (1982). Luigi NONO: ¿Donde estas, hermano? (1982); Sarà dolce tacere (1960). EXAUDI, James Weeks (cond.). Aeon AECD 1441 (1 CD) (http://www.outhere-music.com/en/labels/aeon). Rihm wants to be understood. His long vowels and precise dissonance provide a perfect laboratory for EXAUDI’s perfect intonation and control. As we might expect, Rihm’s choral music stems from the Brahms tradition, but with complex chords tapering into and out of silence. Nono’s pieces account for about 14 minutes of the 57-minute program. If the Rihm is silvery smooth and somewhat conventional, the Nono remains revolutionary and dangerous. Nono’s choral music always seems to be on the edge of collapse, as if one straying voice will topple a house of cards. This is especially true of the quartet, ¿Donde estas, hermano? for two sopranos, one mezzo and one contralto with its leaps and single high notes emerging from nowhere. Nono reaches back to other Venetian masters and antiphony. As Sarà dolce tacere shows, he was also one of the first to break out the phonemes within words and spread and overlap them across different voices, rendering the text unintelligible. Taken in sequence, Nono’s ¿Donde estas, hermano? and Rihm’s Mit geschlossenem Mund come from the same year, but the textless Rihm is much closer to the 1960 Sarà dolce tacere.